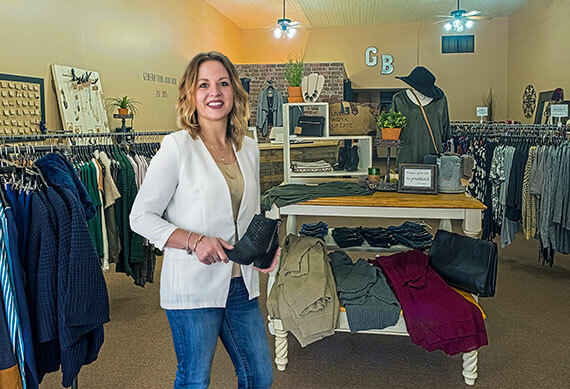 For years, 21-year-old Chelsie Salonek has dreamed of opening her own boutique. She even had a dream location picked out along Minnesota Ave in St. Peter, which she often passed during shopping trips to the Twin Cities. In June of 2015, that dream became a reality—even down to that same storefront. Salonek grew up in New Ulm, attending New Ulm Public Schools before heading to Minnesota West Community & Technical College to earn an associate’s degree in dental assisting. However, her goal always was to open her own business. In February 2015, she saw that the building she liked in St. Peter was open for leasing. Salonek officially opened Generations Boutique in June of 2015. Right now she commutes from New Ulm, but she hopes to move closer to St. Peter soon. She buys most of her apparel through online vendors and apparel markets, stocking her shelves with clothes, shoes, purses and accessories. Currently, she runs the boutique by herself, but she said she does hope to hire help in the near future. In addition, she said she hopes to expand locations and offer more styles. Salonek acknowledged that running her own business is a challenge, but it’s worth it.